The 6th Annual Zippy’s Crusade for Kids charity event is scheduled to take place at The Ole Barn Restaurant in Inlet on Friday and Saturday, January 27th and 28th. Zippy’s Crusade for Kids is a not-for-profit founded by Greg and Nan Zipadelli that utilizes community based events to help raise funding for organizations and families in need. The 2011 event helped to raise substantial funds for Shiners Hospitals for Children, the National Transplant Assistance Fund, Motor Racing Outreach, and the Children’s Homes of Iredell County, among others. All proceeds from the 2012 event will go directly to helping children through the various organizations. 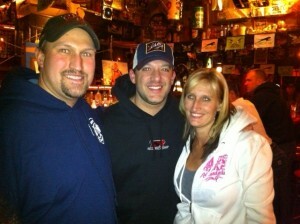 Shawn Hansen, Tony Stewart nad Heather Levi, from left, at the Ole Barn on Thursday. This year’s event will kick off on Friday at The Ole Barn with sign-in and registration at 5 p.m. Between 5:30 and 7 p.m., attendees will enjoy cocktails, heavy hors d’oeuvres, raffles, and live music, which will be followed by the celebrity introductions and presentations of title sponsors, presenting sponsors, and crusaders. At 7:30 p.m., there will be an autograph and meet and greet period, followed by a musical performance by Show Time at 9 p.m. This entry was posted in admin and tagged Tony Stewart, Zippy's crusade for kids on January 26, 2012 by Dana Armington. 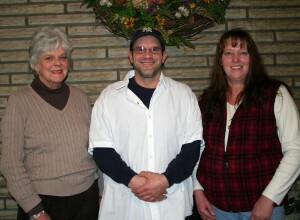 2012's Sweetheart judges Beverly Burnap, Dave Aliasso, and Lesa Parent, from left. The Old Forge Library will celebrate Valentine’s Day with the annual Sweetheart Dessert Contest on Tuesday, February14. Prizes will be awarded in the Youth Student, Teen Student, Adult and Master categories. To enter the contest, create your favorite dessert and bring it to the library between 11 a.m. and 5 p.m. the day of the event. Judges for this year’s contest are Beverly Burnap, David Aliasso and Lesa Parent. This entry was posted in admin and tagged library, sweetheart on January 26, 2012 by admin. 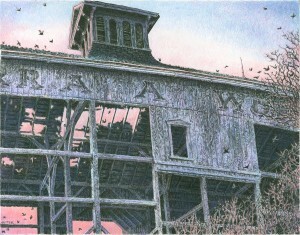 Drawing on our Past: Ink Drawings of New York State’s Historic Architecture, an exhibition of the work of David “RC” Oster will openwith a reception at View on Saturday, February 4th from 5 to 7 p.m.
RC Oster is a self-taught artist who specializes in free-hand ink drawings of regional landmarks and Adirondack scenes. 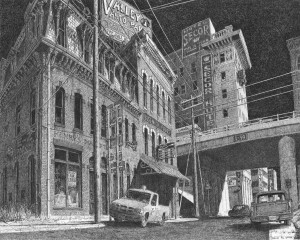 He is particularly well known for his drawings of historic buildings, capturing fine details from sharp angles that highlight their architectural features. Oster’s work will be on display through March 3, and will run concurrently with “Adirondack View Finders” a photography exhibition that showcases top Adirondack photographers including Nathan Farb, Nancie Battaglia, Mark Bowie, and Carl Heilman. Stone sculptures by Matt Horner will also be on display throughout the duration of the exhibits. Exhibition admission is $10/$5 members and groups of six or more. Children under the age of 12 are admitted free of charge. View is a multi-arts center located at 3273 State Rt. 28 in Old Forge. To learn more about View programming visit: www.ViewArts.org or call (315) 369-6411. This entry was posted in admin and tagged RC Oster, view on January 26, 2012 by admin. This entry was posted in admin and tagged call for entries, view on January 26, 2012 by admin. The Big Moose Fire Co. and Big Moose Ambulance Co. recently received a $1,000 donation from Dave Peterson of Fourth Lake and Boonville, to install a new Camoplast track on its rescue snowmobile. This entry was posted in admin and tagged Big Moose, Fire Department on January 26, 2012 by admin. 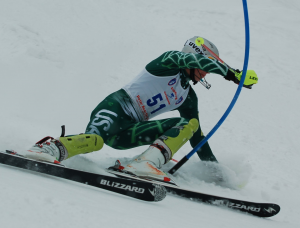 The Town of Webb Varsity Alpine Ski Team competed in a slalom event at McCauley Mountain on Saturday, January 21. The course was tough, as it was icy on the headwall and at the flush near the end of the race. Despite the conditions however, the TOW girls’ and boys’ teams each took first place honors. Jessica Hannah took first place in the first run with a time of 50.72 seconds, and Mara Gaffney took second with a time of 56.15 seconds. Lexie Haehl took 6th place, Camry Liddle and Danielle Gibbs took 9th and 10th, respectively, and Maggie Queen came in 15th place. MacKenzie Kelly, Ella Mitchell, and Brianna Brownsell placed 21st, 22nd, and 23rd respectively. 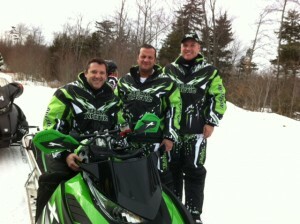 This entry was posted in admin and tagged Alpine Skiing, school, Town of Webb on January 26, 2012 by Dana Armington. 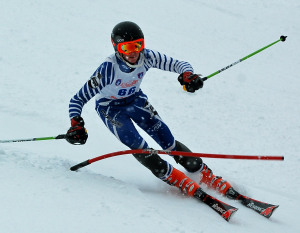 The Junior Polar Bear Ski Team has had a busy race schedule this season. Following are the results of their current races. This entry was posted in admin and tagged Polar Bear Club on January 26, 2012 by admin.